Once the plugin has been successfully connected, a new menu option - HTML To CF Connector - is exposed in the settings area of the Canvasflow publication. This menu provides additional connector configuration. 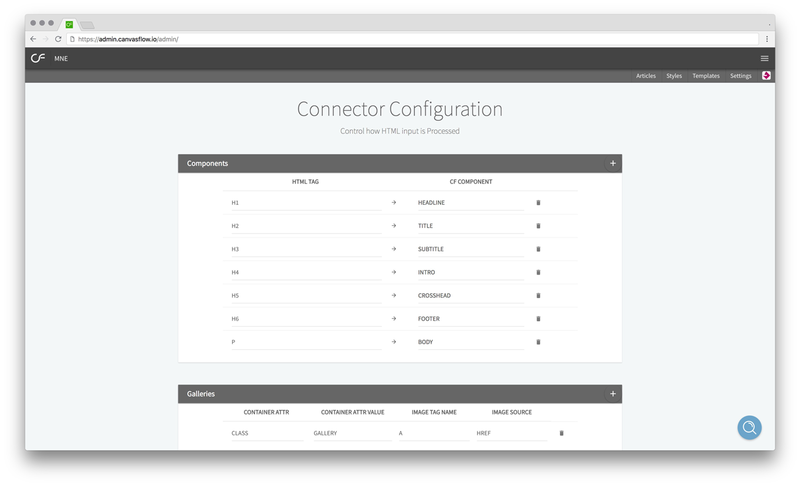 To begin, click Configure Connector, you will be presented with a configuration screen. The component section makes it possible to control how the mark-up from a WordPress article is converted when published to Canvasflow. By matching the incoming HTML tag (eg. H1, H2) to the required Canvasflow component type (Title, Subtitle), you can minimise any post publish editing while ensuring the correct structure of your article. 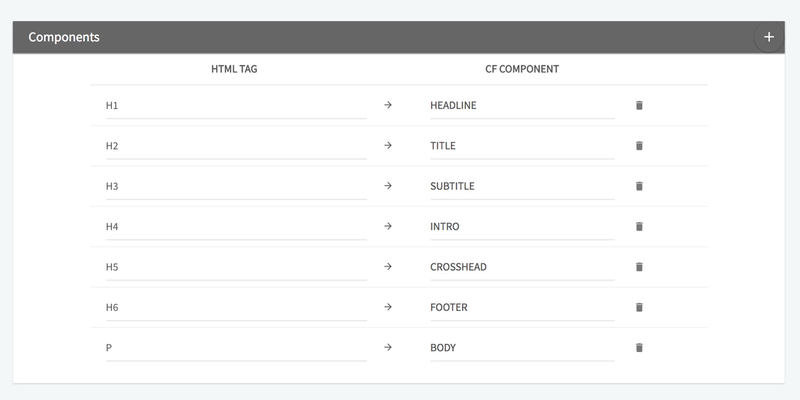 By default, Canvasflow matches the basic HTML tags to the corresponding Canvasflow components. In the components section, click the 'Add' button. In the components section, find the corresponding Canvasflow component to the HTML tag you wish to edit and click to select a new option. Coming soon – does not currently have an effect. By default, everything that exists in the ‘body’ field of an WP post will be transferred to Canvasflow at the point of publish. There may however be occasions where it is not desirable to publish all body content. For example, a post may include social links or author information that may not be required when publishing to Canvasflow. The 'Content Excludes' feature provides a simple way to exclude content from being processed by Canvasflow, by filtering out all content that matches a particular attribute. For example you may wish to exclude all <span> with a <span class=‘author’>, all div’s with an <div id=‘social’>, or a paragraph with <p class=’intro’>. In the custom exclude section, click the Add button. In the Exclude section, find the exclude you wish to remove.